Originally, Madrid was a small town on a strategic crossroad. This historic characteristic has had a big influence in the Madrid’s openness. Food is also affected by this and la Tapería La Pequeña Graná is one example. “Graná” is the Andalusian phonetical name for Granada. 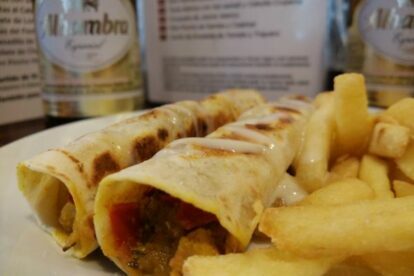 Granada is a beautiful town in the south of Spain know for many things, one of them is their beer and tapas. All bars in Spain used to provide a free tapa when you ordered a drink. Unfortunately this tradition is slowly disappearing throughout Spain, due to the capitalist mentality. For example, lately in Madrid generally they only give chips or olives. This is a reminiscence of what used to be quality or varied tapas served by only asking for a drink. Now you must know which places to go to for this. Granada and Tapería La Pequeña Graná, on the another hand, is still a stronghold for this traditional concept. When you ask for drinks, they even provide you with a menu from which you can choose your own tapa! Beautiful! I still haven’t had the chance to go through all the menu, but I liked the breaded eggplant a lot. Another great plus is the beer they offer. They have different variants of the beer Alhambra, one of the top favourite beers of Spanish people. If you like to eat and drink good beer, this is definitely your place!